COMMENT & ANALYSIS: Two new schools were recently given planning permission in my home town, Ballina, Co Mayo, but the cycling planning with both can be described as fig leaf. It should be noted: None of this article should be viewed as criticisms on individual schools — these are systematic issues and it’s unlikely many schools in Ireland would know better. There are many reason why girls in Irish secondly schools may not cycle — the hill up to St Mary’s mentioned above is — practicality speaking — unlikely near to the main barrier. The school is known to have a strict uniform policy and uniforms — especially for girls — are a known barrier for cycling to school. The barriers to cycling to school isn’t just one thing and the problems for students and parents differ (there’s loads of research online including this from WIT). The likes of promoting high-vis and helmets is a non-runner for image conscious teenagers. The one-way streets, poor cycle lanes, streets with no cycle lanes and streets with cycling provision in just one direction make for a poor cycle network around the town. Where the cycle lanes or segregated tracks are half decent, they often aren’t connected to anything or are poor or give up at junctions [more on this is a different article]. The above drawing shows a new T-junction which forms the new access point to the school. There’s currently low-quality segregated cycle paths along the main road here, called Sli Ectra (see Street View) — the plan is to lower the cycle track to a cycle lane at the new T-junction. 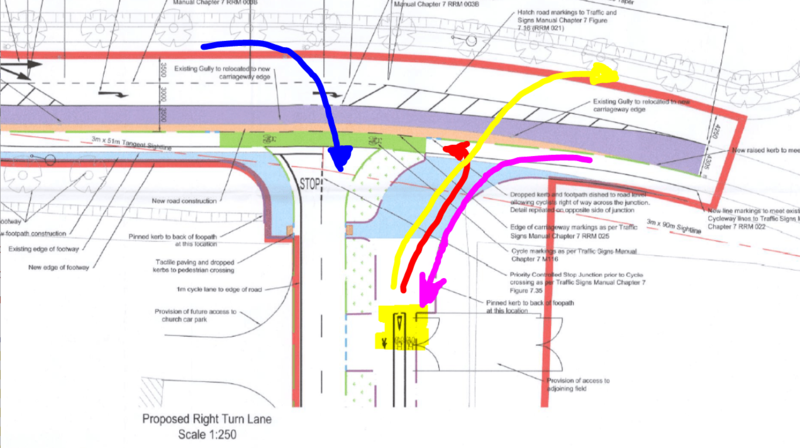 This isn’t best practice but it is better than the shared solution already used on an existing T-junction on the other side of the road, partly shown on the right hand edge of the above drawing. We’d comment further on those design choices, but it’s not the worst part… in the above image, the the start of two-way cycle path on the new road is highlighted (by us) and the dreadful thing is that it doesn’t connect to anything. The above image shows the type of movements which should be linked into the two-way cycle path (again, rough lines with arrows added by this website). None of these movements seem to be catered for. Because the cycle path on the main road (going right to left in the drawing) is lowered ahead of the junction, not even the right turn (red arrow) from the school out to the main road seems to be allowed for here. 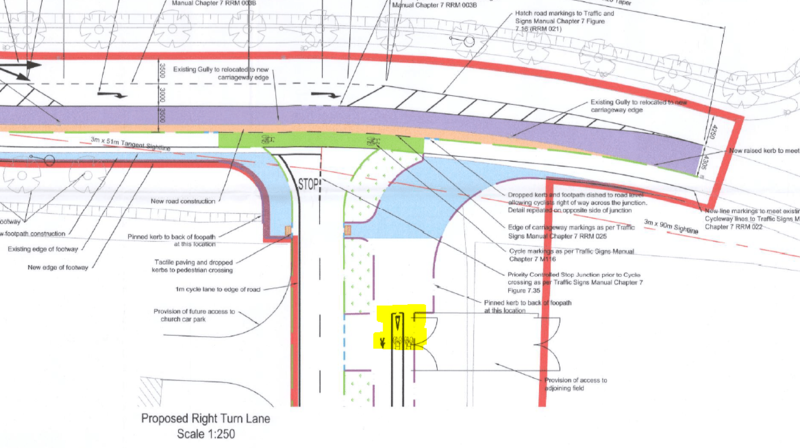 In fairness to the council’s roads section — the planning file shows that they highlighted the issues for cycling (and well as other issues with the design). But it’s not clear if or how these issues will be resolved in the final design. Going by the record all around Ireland, it would be unusual if all the issues are resolved. The graph above shows a cyclist going the wrong way up a one-way street to access the walking/cycling access and a motorist coming out of an entry-only side street towards the wrong way up a one-way street. The above extract of the larger map above (click for interactive version) shows the new school site in shaded purple with the walking/cycling access meeting the yellow line, which is a one-way street, with no contra-flow for cycling. The black lines shown here are national roads with heavy traffic and no cycling provisions (the town isn’t bypassed). Another option — or rather a third access point — should have been provided: A walking/cycling route from the town centre to the school site via the housing estates east of the new site and the old school grounds. Gradients could have been managed with cycling-friendly ramps up to the new school via the park planned on the east of the school grounds. This doesn’t seems to have been even looked at. Cycle lanes and footpaths alone with out providing for simple crossings of a road or links to the rest of a town, add up to fig leaf provision. Part two is set to be published on Tuesday. Red is the color used for cycling infrastructure in The Netherlands.